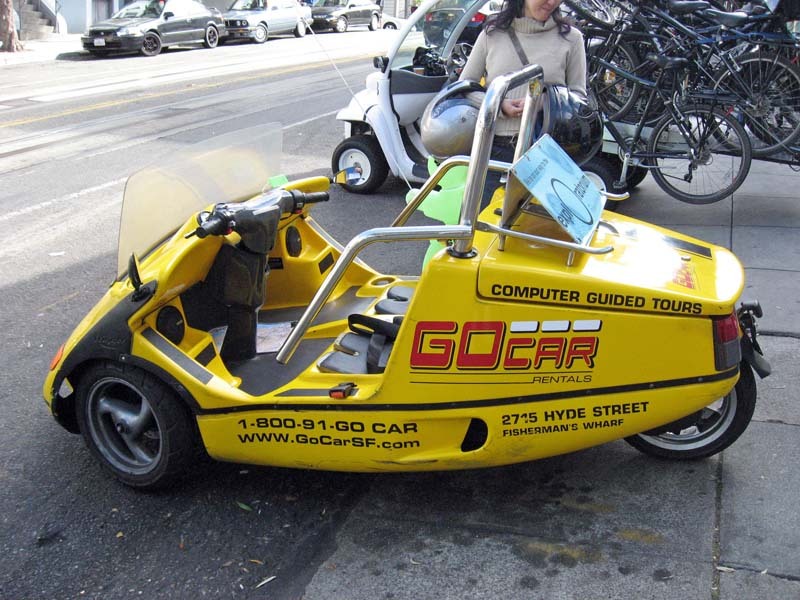 Just for fun we rented a Smart Car (Smart Fortwo Passion Yellow Cabriolet Convertible) from Alchemy Rentals in San Francisco, and then the next day went for a Gocar tour in San Francisco (it's a tiny 3 wheel street legal Go-Kart). 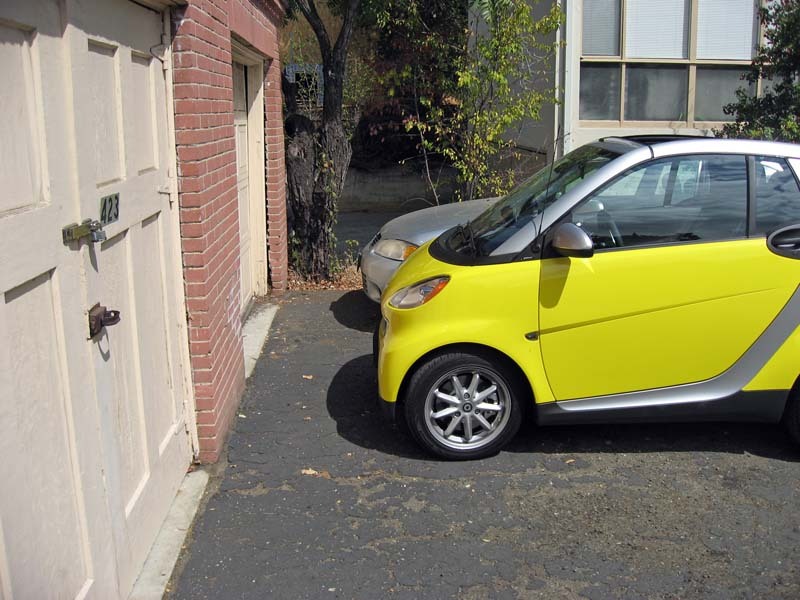 A "Smart Car" is a two person car that is the smallest car now sold in the USA. Click on any picture for a much larger version. 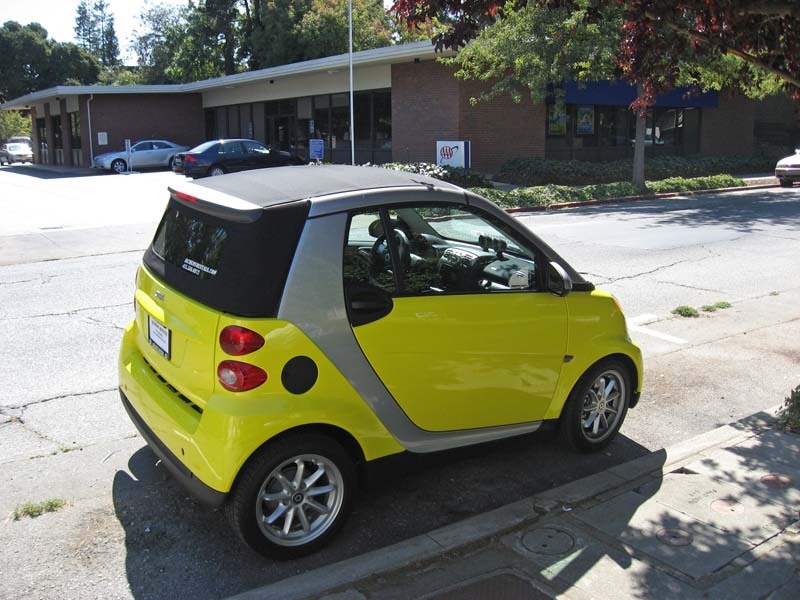 Below is the rental Smart Car. It's a Smart Fortwo Passion Cabriolet (Convertible). That's Casey Jones on the far left, Tim Nufire, and Brian Wilson (me) on the right by the driver's side door. Just to be absolutely clear, we drove this car on the highway and it easily goes 70 mph (and much faster if you need to pass) and is perfectly stable at those speeds. It also ran up and down the hills in San Francisco with no problems at all, it's actually quite a peppy little car mainly because it's so small and light. Notice I'm a big guy (6 foot 3 inches) and I had TONS of head room in the car. 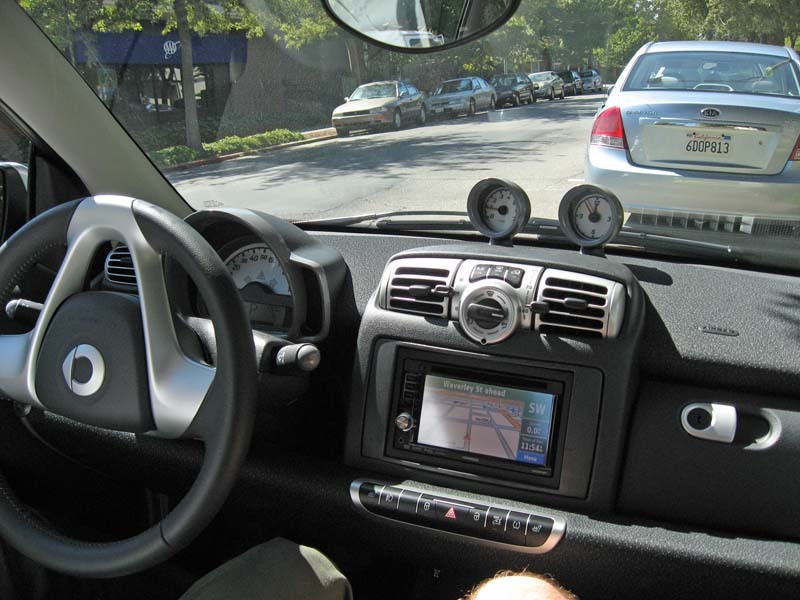 Here is a picture of the dash of the Smartcar. That's an aftermarket Kenwood GPS in the dash. 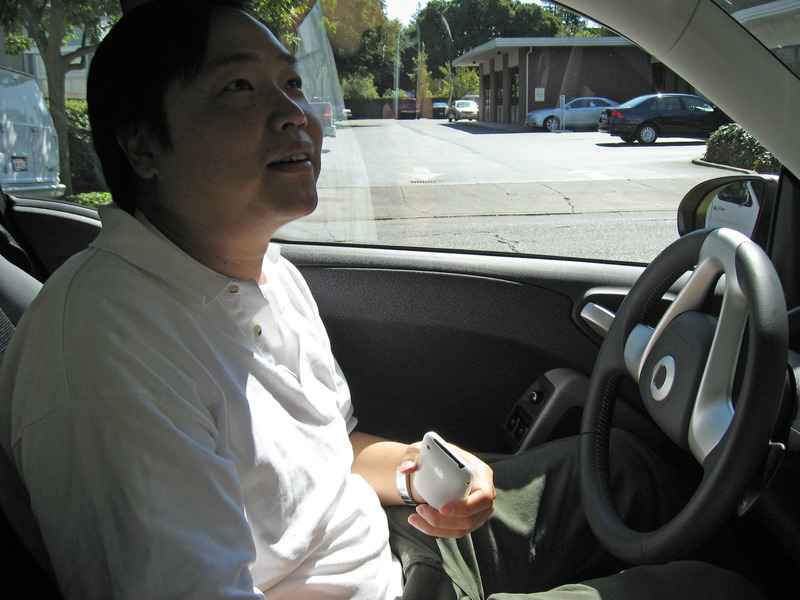 Billy Ng sitting in the driver's seat. 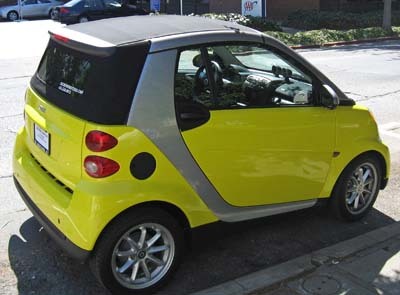 Picture of the Smart Car on the street. It's in a standard parking spot, but only taking up half the parking spot. 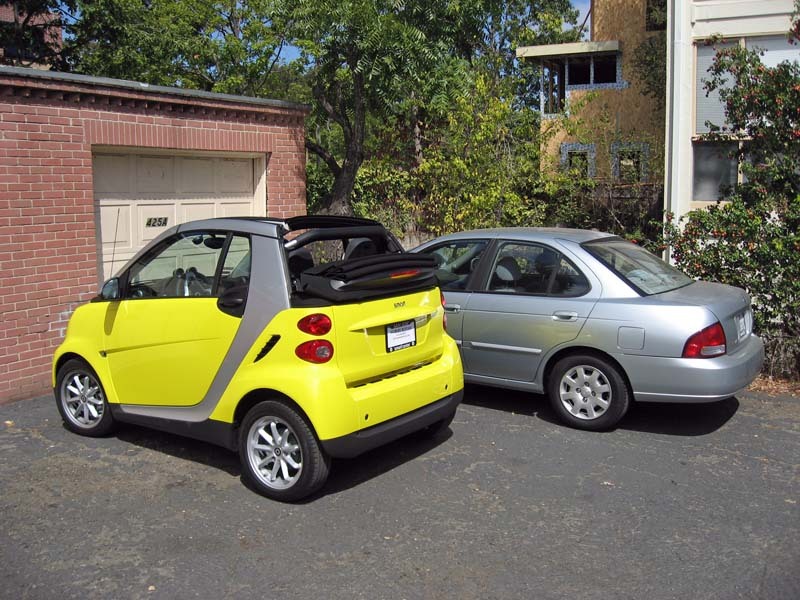 Just to show it's length, here is the Smart Fortwo parked next to my Nissan Sentra. The front bumpers of the two cars are lined up. Notice the Smart Fortwo ends at the back of the driver's door on the Sentra!! It's half the length of a "compact" car! A picture showing how the front bumpers of the Smartcar and the Nissan Sentra are lined up. 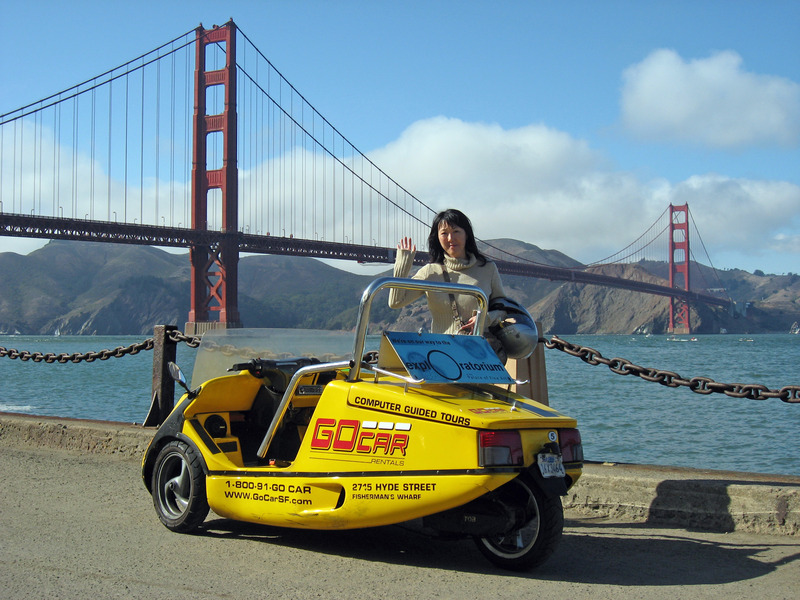 The next day my friend Katherine Chung and I went on a Gocar tour in San Francisco. 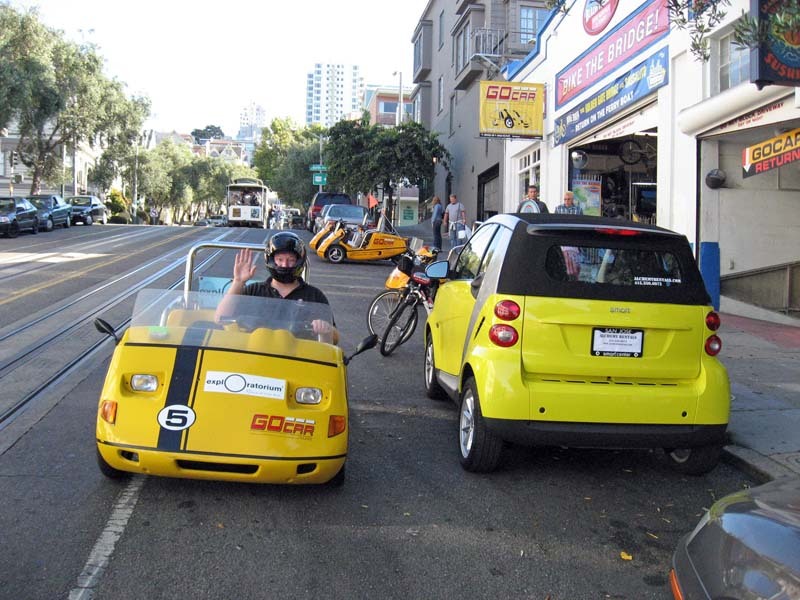 Here I am driving the Gocar pulled up beside our Smartcar to compare the sizes. 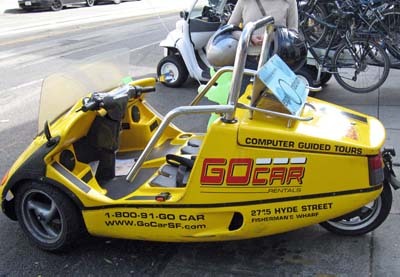 A close up of the Gocar we drove on a tour for 2 hours. 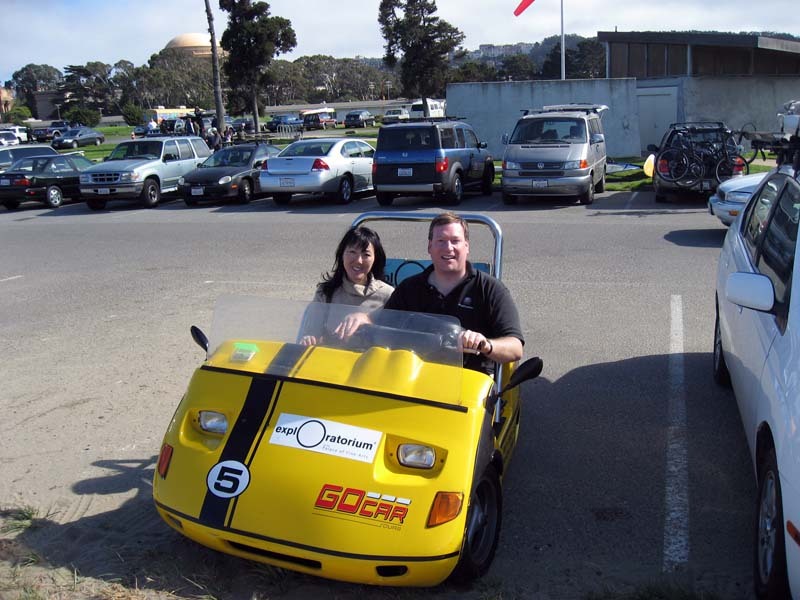 Along the 2 hour tour, a random person took this picture of Katherine and I in the Gocar. The Gocar has a GPS that gives you directions and also tells local history and information as you drive along the streets. We took the "Golden Gate Bridge to Lombard" tour, but there are several available. 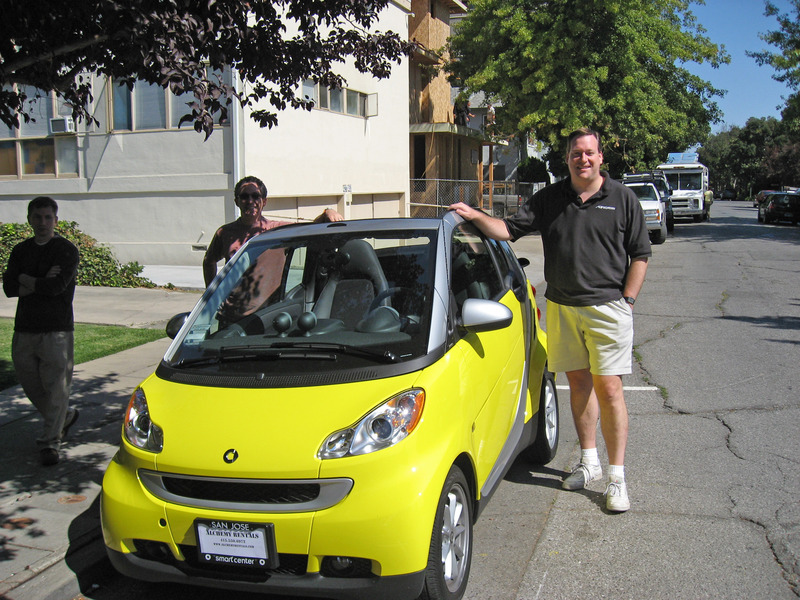 It was fun and entertaining and I would do it again, but UNLIKE the Smartcar, the Gocar was totally gutless. If you accelerated as fast as possible, it would BARELY crawl along, and it's top speed even downhill was 30 mph. It could barely climb the smaller hills in San Francisco, and comes to a stop on any steep hills. 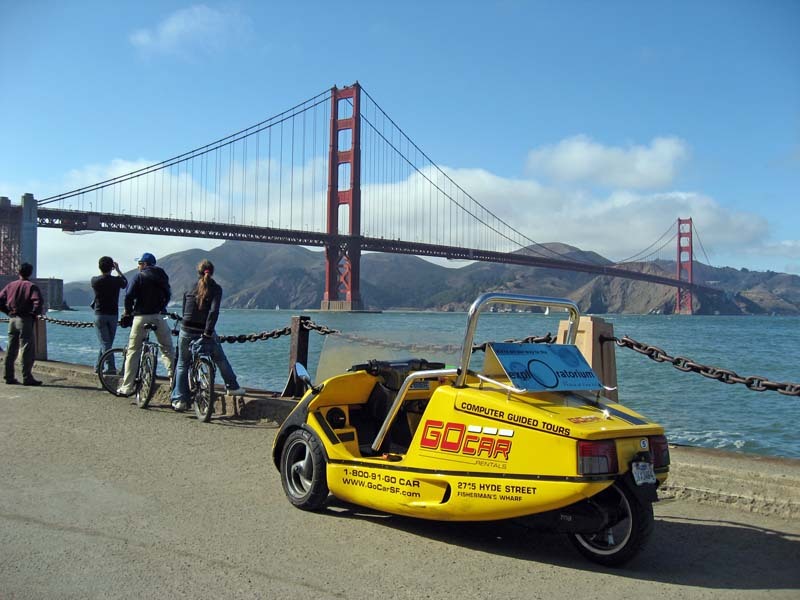 Along the tour we took, here is the Gocar parked in front of the Golden Gate bridge at one stop. Same spot, a picture of Katherine with the Gocar and the Golden Gate Bridge in San Francisco in the background.